Before the invention of the printing press in the fifteenth century, the great majority of people were illiterate. Together with preaching, the wonderful story of the birth, life, death, and resurrection of Jesus was told through the medium of stained glass. 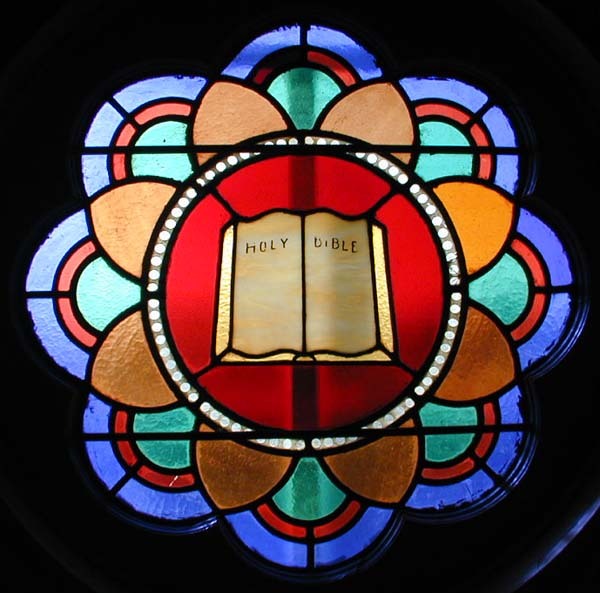 Christian churches had colored glass windows as early as the fifth century, but the art of stained glass reached its height in the Middle Ages, particularly 1150-1250. 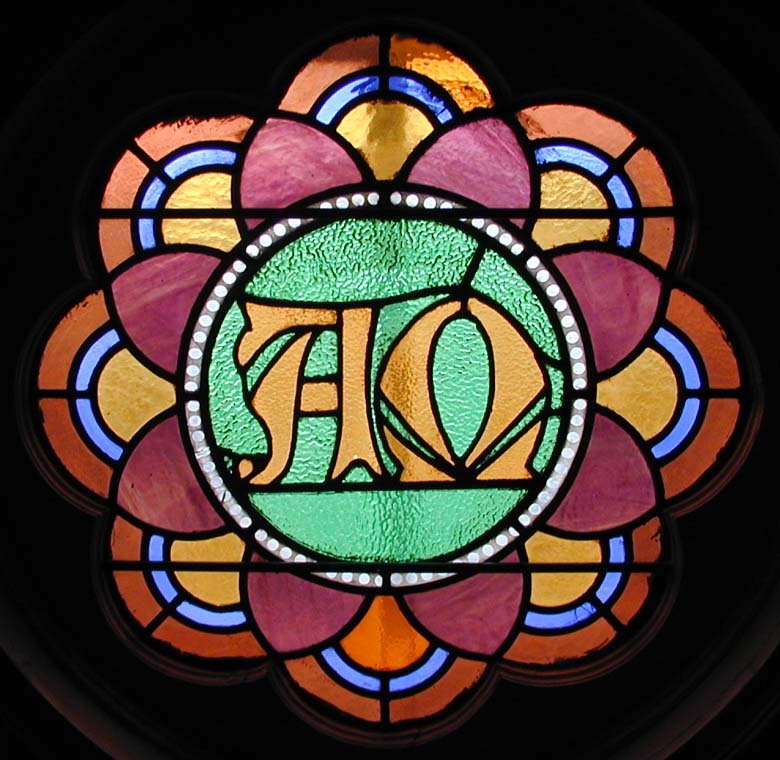 Not only does the glass provide visual beauty to the church, it also helps convey the meaning of God's Word. The stained glass windows at Augustana Lutheran Church are made of Austrian glass and were purchased in Chicago. The windows were repaired by Glass Art of Winona, Minnesota in 1950 at the cost of $450 with ten tilt-in ventilators added at the bottom of each bay for $350 each. The church saved leftover glass from this repair job and when a window was removed to make a doorway to the Northwest parking lot. 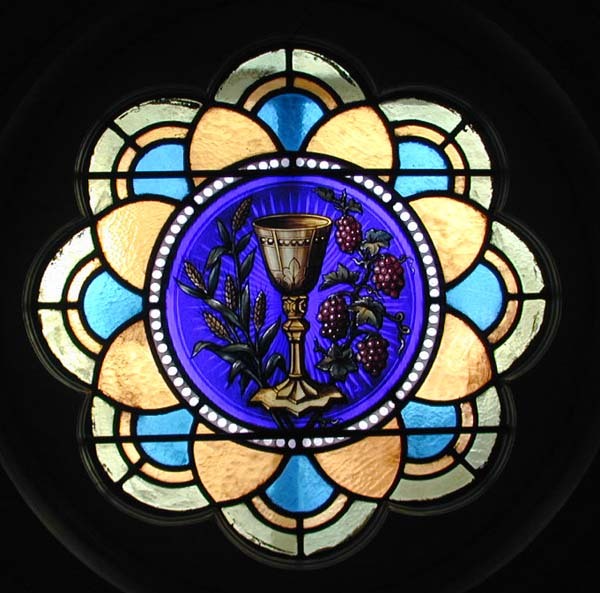 This glass was utilized in the 1979 renovation of the church undercroft. Frank's Follies in Hinton made the windows and door inserts for St Erik's Chapel. Norman Bennet made the large windows for the Wittenberg Library and the small windows in the offices. The beauty and message of the ten large windows on the north and south sides of the nave have been part of the ministry of the congregation since the present church was built in 1889. 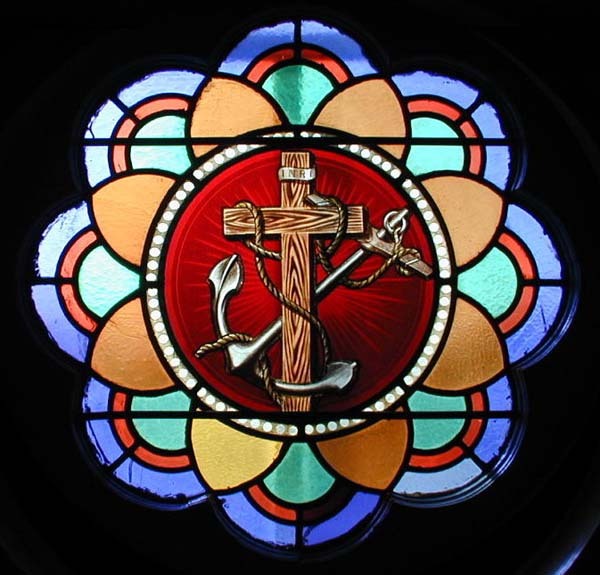 The images in the windows depict a variety of theological statements from sacraments to symbols of faith to statements of how we understand God. The windows are described in order beginning with the window in the northwest corner and ending with the window in the southwest corner. We believe in the Triune God-Father, Son, and Holy Spirit. This window uses the Latin Pater, Filius, and Spiritus Sanctus to name the persons in the Trinity. One God and Three Persons is a great mystery of the Church. 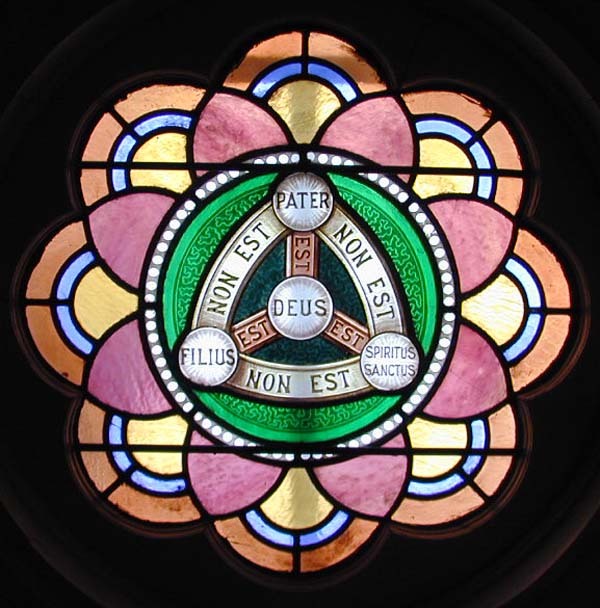 The window explains that the Persons are not each other, but each is God (Deus). 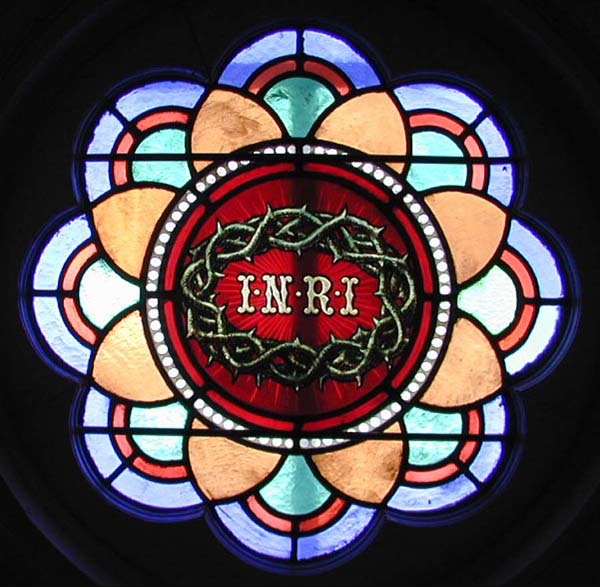 These letters, surrounded by a crown of thorns, remind us of the sign Pontious Pilate ordered to be placed above Jesus' head as he hung on the cross. The sign read, "Jesus of Nazareth, King of the Jews." 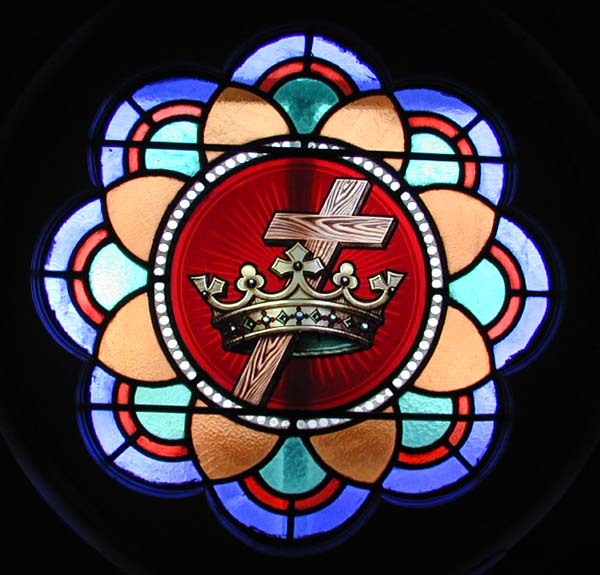 No king should have a cross as a throne, and yet, it is this horrible means of death that becomes the seat of power over death and the King of the Jews becomes the Savior of All. Holy Communion is one of the two sacraments in the Lutheran Church. In this sacrament we eat bread and drink wine. Jesus promises to be present in, with, and under these forms: "this is my body...this is my blood." In this sacrament we receive another thing Jesus promises: the forgiveness of sin. Jesus is referred to as prophet, priest, and king. On the last Sunday of the Church year we gather to celebrate Christ the King. Through Jesus' suffering and death on the cross and his resurrection from the dead, he is given royal authority over heaven and earth. The cross represents Jesus' suffering and death. The anchor symbolizes the foundation of the Christian faith; our hope is in Jesus Christ alone. "You shall have no other Gods." In love God gave the children of Israel the commandments. The first three tell how God expects us to be in relationship with other humans. 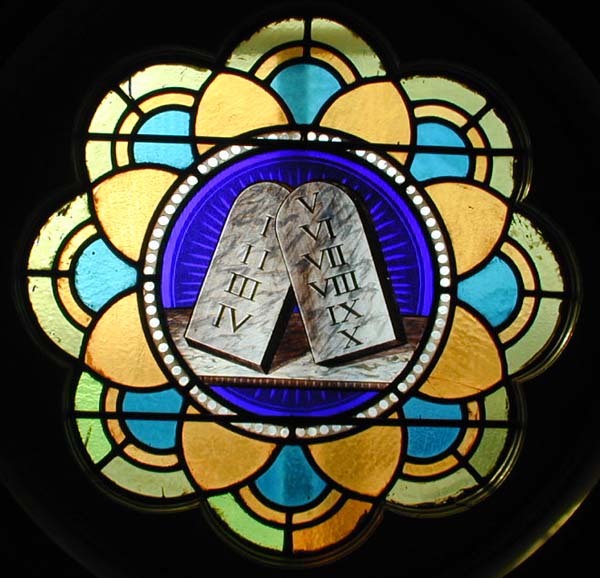 Keeping the commandments is what we do in response to what God has first done for us. Luther says, "We are to fear and love God, so that we do not despise God's Word or preaching, bur instead keep that Word holy and gladly hear and learn it." It is through the inspired Word of God presented to us in the Holy Scriptures, that we come to learn about God's great love for us. 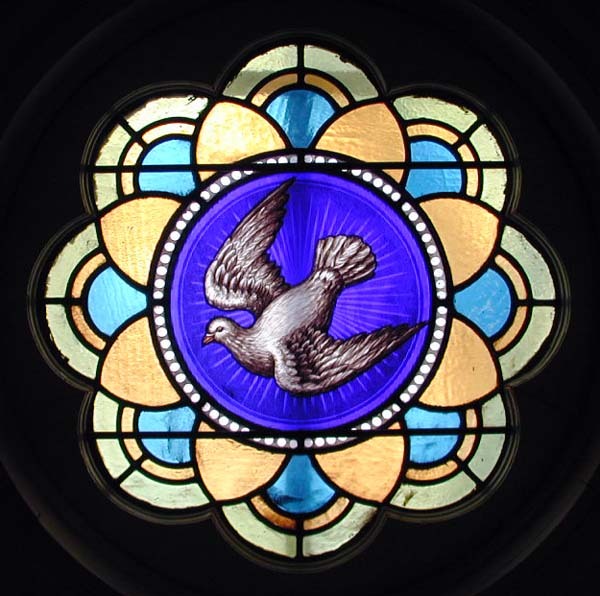 Just as the Holy Spirit inspired the authors to tell the story, so the Holy Spirit enlightens us with the truth contained in these scared pages. 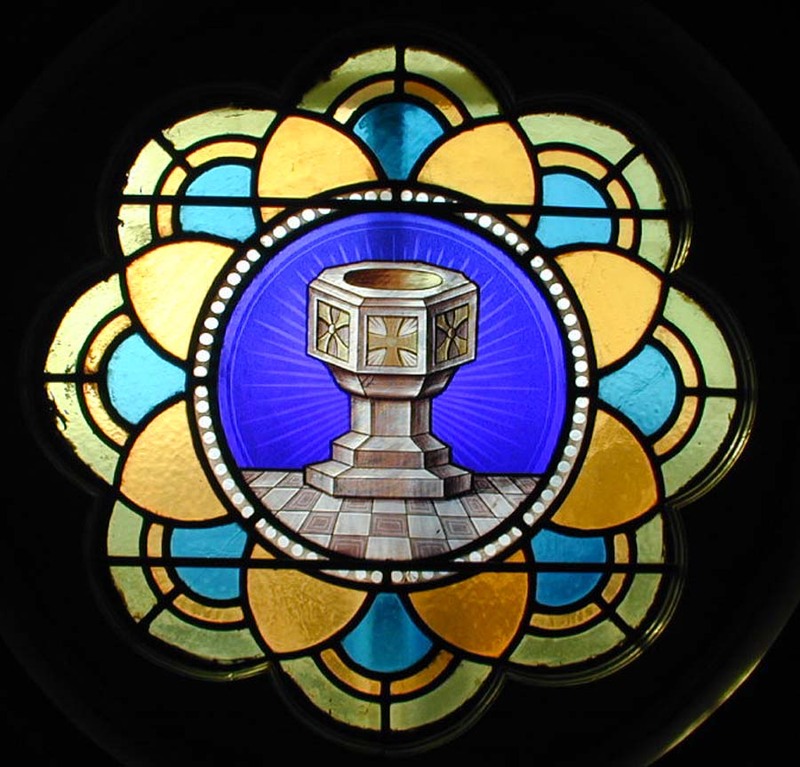 Baptism is one of the two sacraments in the Lutheran Church. In the waters of Holy Baptism we are made sons and daughters of God. That font, then, reminds us Whose we are and of the great love that God has for us. We believe in God who has always been and who will always be. He is the first and the last. The stained glass windows at Augustana Lutheran Church have been here since 1889 when the church was built. Our goal is to preserve them for another 100-plus years. We pray that their beauty will inspire people to praise our Triune God and worship him with all glory and honor.